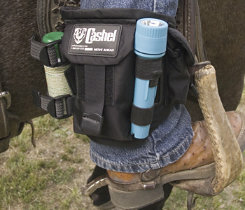 The Cashel® Ankle Safe is the perfect place to carry those important items you must have on the trail in the unlikely event that you get separated from your horse. The Ankle Safe features a padded inner lining and elastic closure to make it comfortable. A specially designed pocket will hold a cell phone, plus smaller side pockets to hold ID, keys, cash and any other necessary item. An excellent choice for riders. Also great for joggers, mountain bikers or as safe substitute for a wallet.